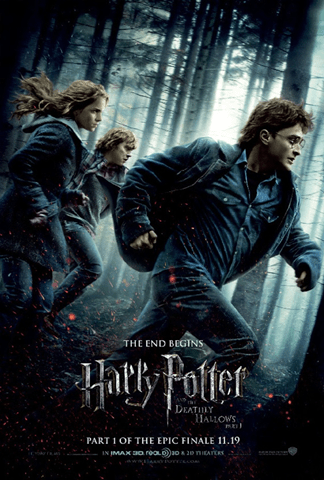 Description: Part 1 begins as Harry, Ron and Hermione set out on their perilous mission to track down and destroy the secret to Voldemort’s immortality and destruction—the Horcruxes. On their own, without the guidance of their professors or the protection of Professor Dumbledore, the three friends must now rely on one another more than ever. But there are Dark Forces in their midst that threaten to tear them apart. EN 5 Second Review: Although it makes no difference if we recommend it or not as fans will see it and the rest will not, we are going to go ahead and recommend this for the sake of continuity. This is the darkest Potter yet and it has one flaw above all else, its going to be a long 8 months as we feel somewhat frustrated and taken by the moviemakers who made this as a placeholder more than a movie. So although to make the series complete it cannot be missed, prepare to be frustrated. Identical – Ron (Rupert Grint), Hermione (Emma Watson) and the gang turn into Harry Potter (Daniel Radcliffe). Deathly Hallows: Harry (Daniel Radcliffe) learns about the deathly hallows. Premiere: See Daniel Radcliffe, Emma Watson and the rest on the red carpet at the London Premier.